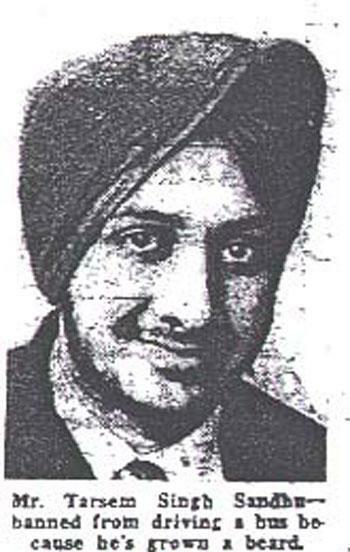 In August 1967, a 23 year old Sikh man from Merridale, Wolverhampton, Tarsem Singh Sandhu, was turned away from his job as a bus driver. After some time off for illness, Tarsem had decided to recommit to his faith and to wear the traditional beard and turban. Tarsem Singh Sandhu came back to work the following two days, by which time his employers told him to remove his beard and turban – or lose his job. In 1955, 50 immigrant workers were employed on the buses out of 900. By 1960 there were 300, and by 1965 it was 600 – meaning that half of Wolverhampton’s bus drivers were Sikhs. The Transport Committee argued at first that to make an exception for Tarsem’s beard an exception would have to be made for all. But their decision to include turbans in the dispute caused many to feel that the Sikh community was being unfairly treated. The transport committee and local politicians could have had no idea of the response which was to unfold. The importance of this support is huge, especially as the ‘Transport and General Workers Union’, as well as other unions, refused to publicly support or criticise the Committee’s decision to ban beards and turbans. 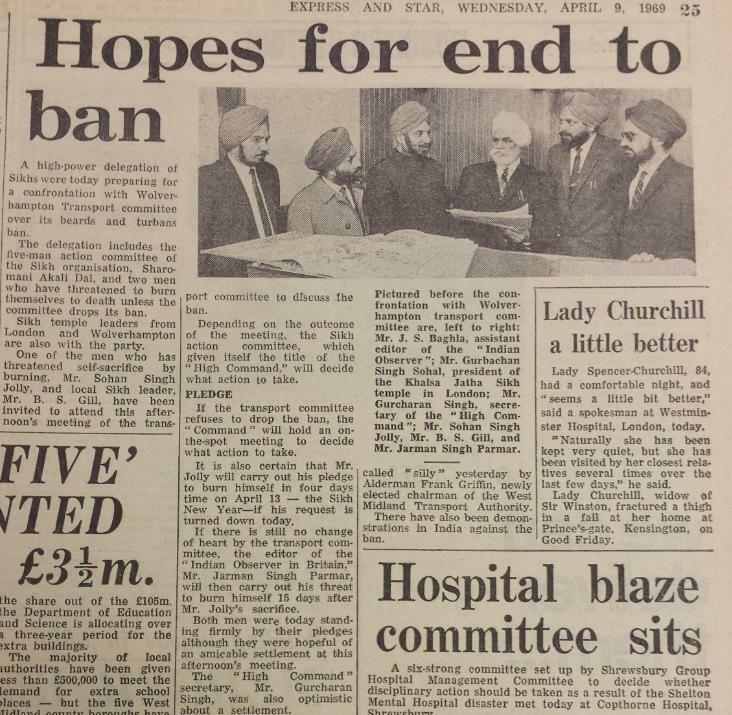 It soon became clear that neither the Transport Committee, unions or Wolverhampton’s Sikhs would change their decisions, and so, with the help of Panchi and Jolly, the campaign to change the ban on beards and turbans began in 1968. Sikhs in Wolverhampton refused to take the ban lying down. In coming together, a powerful campaign for social and religious justice was started. A wave of protests organised by Sikh political and community groups followed. In Wolverhampton a demonstration in the town centre attracted a crowd of five thousand people with a petition calling for Sikhs to be allowed to wear beards and turbans at work. However, unions and local politicians refused to listen to the increasingly vocal public support. A further two protests were launched – this time marching to Downing Street with a petition letter. 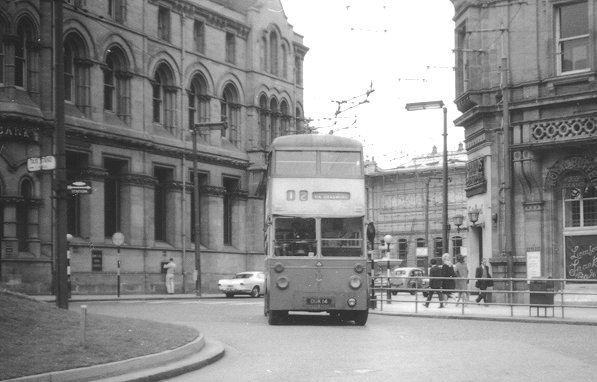 The first protest was held in Wolverhampton, aimed at convincing the Transport Committee to change its decision. However they still would not listen, and so two further marches in London were organised by the Shiromani Akali Dal and its leaders. This is the moment where support for Wolverhampton’s Sikhs became very public. 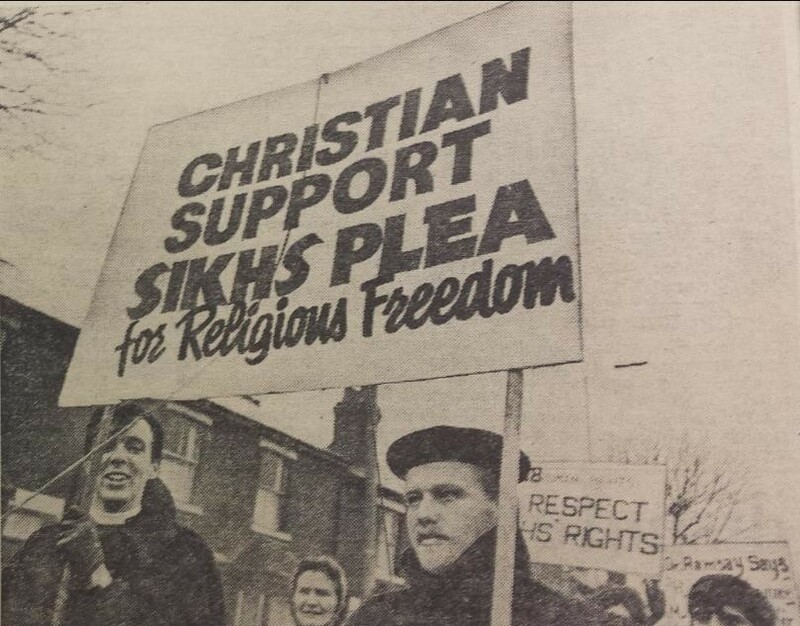 A year of protests and negotiations came to a head in 1969, when Sohan Singh Jolly promised to commit suicide by burning himself to death, unless the rights of Sikhs in Britain to express their religion and tradition at work was protected. This threat made it clear to politicians and Transport Committee members that for some the turban ban was not merely politics, but a challenge to an entire way of life. 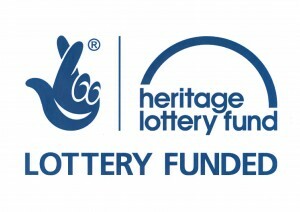 The importance of this episode of Wolverhampton’s history should not be understated – this campaign for religious and civil rights helps us to understand the way Wolverhampton has become the city it is today, something we may take for granted. The Turban, a simple piece of cloth of various lengths worn around the head, mainly in the North Tropics, from Northwest Africa, East Africa down to the Swahili Coast all the way across the Middle East countries, through India on to Malaysia and Indonesia. How or where the Turban started is not known though it can be traced back presently at least about five thousand years, back into the Bronze Age. The ancient Greeks regarded the beard as a badge or sign of virility; in the Homeric epics it had almost sanctified significance, so that a common form of entreaty was to touch the beard of the person addressed. It was only shaven as a sign of mourning, though in this case it was instead often left untrimmed. A smooth face was regarded as a sign of effeminacy. The Spartans punished cowards by shaving off a portion of their beards. From the earliest times, however, the shaving of the upper lip was not uncommon. Greek beards were also frequently curled with tongs. In ancient India, the beard was allowed to grow long, a symbol of dignity and of wisdom. The nations in the east generally treated their beards with great care and veneration, and the punishment for licentiousness and adultery was to have the beard of the offending parties publicly cut off. They had such a sacred regard for the preservation of their beards that a man might pledge it for the payment of a debt. Achaemenid era wore long beards, warriors adorning theirs with jewellery. Men also commonly wore beards during the Safavid and Qajar eras. In the time of Alexander the Great (356 BC–323 BC) the custom of smooth shaving was introduced. Reportedly, Alexander ordered his soldiers to be clean-shaven, fearing that their beards would serve as handles for their enemies to grab and to hold the soldier as he was killed. The practice of shaving spread from the Macedonians, whose kings are represented on coins, etc. with smooth faces, throughout the whole known world of the Macedonian Empire. Mesopotamian civilizations (Sumerian, Assyrians, Babylonians, Chaldeans and Medians) devoted great care to oiling and dressing their beards, using tongs and curling irons to create elaborate ringlets and tiered patterns. The highest ranking Ancient Egyptians grew hair on their chins which was often dyed or hennaed (reddish brown) and sometimes plaited with interwoven gold thread. A metal false beard, or postiche, which was a sign of sovereignty, was worn by queens and kings. This was held in place by a ribbon tied over the head and attached to a gold chin strap, a fashion existing from about 3000 to 1580 BC. Confucius held that the human body was a gift from one’s parents to which no alterations should be made. Aside from abstaining from body modifications such as tattoos, Confucians were also discouraged from cutting their hair, fingernails or beards. To what extent people could actually comply with this ideal depended on their profession; farmers or soldiers could probably not grow long beards as it would have interfered with their work. Most of the clay soldiers in the Terracotta Army have moustaches or goatees but shaved cheeks, indicating that this was likely the fashion of the Qin dynasty. Most Chinese beards are thin and the moustaches were kept similar to cat’s whiskers. Late Hellenistic sculptures of Celts portray them with long hair and moustaches but beardless. Among the Gaelic Celts of Scotland and Ireland, men typically let their facial hair grow into a full beard, and it was often seen as dishonourable for a Gaelic man to have no facial hair. The ancient Semitic civilization situated on the western, coastal part of the Fertile Crescent and centred on the coastline of modern Lebanon gave great attention to the hair and beard. Where the beard has mostly a strong resemblance to that affected by the Assyrians, and familiar to us from their sculptures, it is arranged in three, four, or five rows of small tight curls, and extends from ear to ear around the cheeks and chin. Sometimes, however, in lieu of the many rows, we find one row only, the beard falling in tresses, which are curled at the extremity. There is no indication of the Phoenicians having cultivated mustachios. Shaving seems to have not been known to the Romans during their early history (under the kings of Rome and the early Republic). Pliny tells us that P.Ticinius was the first who brought a barber to Rome, which was in the 454th year from the founding of the city (that is, around 299 BC). Scipio Africanus was apparently the first among the Romans who shaved his beard. However, after that point, shaving seems to have caught on very quickly, and soon almost all Roman men were clean-shaven; being clean-shaven became a sign of being Roman and not Greek. Only in the later times of the Republic did the Roman youth begin shaving their beards only partially, trimming it into an ornamental form; prepubescent boys oiled their chins in hopes of forcing premature growth of a beard. Still, beards remained rare among the Romans throughout the Late Republic and the early Principate. In a general way, in Rome at this time, a long beard was considered a mark of slovenliness and squalor. The censors L. Veturius and P. Licinius compelled M. Livius, who had been banished, on his restoration to the city, to be shaved, and to lay aside his dirty appearance, and then, but not until then, to come into the Senate. The first occasion of shaving was regarded as the beginning of manhood, and the day on which this took place was celebrated as a festival. Usually, this was done when the young Roman assumed the toga virilis. Augustus did it in his twenty-fourth year, Caligula in his twentieth. The hair cut off on such occasions was consecrated to a god. Thus Nero put his into a golden box set with pearls, and dedicated it to Jupiter Capitolinus. The Romans, unlike the Greeks, let their beards grow in time of mourning; so did Augustus for the death of Julius Caesar. Other occasions of mourning on which the beard was allowed to grow were, appearance as a rues, condemnation, or some public calamity. On the other hand, men of the country areas around Rome in the time of Varro seem not to have shaved except when they came to market every eighth day, so that their usual appearance was most likely a short stubble. In the second century AD the Emperor Hadrian, according to Dion Cassius, was the first of all the Caesars to grow a beard; Plutarch says that he did it to hide scars on his face. This was a period in Rome of widespread imitation of Greek culture, and many other men grew beards in imitation of Hadrian and the Greek fashion. Until the time of Constantine the Great, the emperors appear in busts and coins with beards; but Constantine and his successors until the reign of Phocas, with the exception of Julian the Apostate, are represented as beardless. In the Middle-Age Europe, a beard displayed a knight’s virility and honour. The Castilian knight El Cid is described in The Lay of the Cid as “the one with the flowery beard”. Holding somebody else’s beard was a serious offence that had to be righted in a duel. While most noblemen and knights were bearded, the Catholic clergy were generally required to be clean-shaven. This was understood as a symbol of their celibacy. In pre-Islamic Arabia men would apparently keep moustaches but shave the hair on their chins. The prophet Muhammad encouraged his followers to do the opposite, long chin hair but trimmed moustaches, to signify their break with the old religion. This style of beard subsequently spread along with Islam during the Muslim expansion in the Middle Ages. Guru Gobind Singh, the tenth Sikh Guru, commanded the Sikhs to maintain unshorn hair, recognizing it as a necessary adornment of the body by Almighty God as well as a mandatory Article of Faith. Sikhs consider the beard to be part of the nobility and dignity of their manhood. Sikhs also refrain from cutting their hair and beards out of respect for the God-given form. Kesh, uncut hair, is one of the Five Ks, five compulsory articles of faith for a baptized Sikh. As such, a Sikh man is easily identified by his turban, uncut hair and beard. Though turbans are worn primarily by men, literary evidence reveals that they were used by women too, on rare occasions in the past. “In Vedic literature Indrani, wife of Indra, wears a headdress known as usnisa”. Some of the earliest terms for the turban in English are turbant, tolibanl, and turband. These represent the French adaptation of the Turkish tulbend, a vulgarism for the term dulbend from Persia, didband, a scarf or sash wound around the neck. In India this headdress is known by many different names locally. Potia, usnisa, pag, pagri, safa, and veshtani are some of the names used for the turban. The Sikhs, a community that dictates it’s followers wear the turban, call it Dastaar, while the Muslim religious leaders refer to it as the kalansuwa. In the earliest times, cotton was the fabric most commonly used as turban material. This is because it was affordable and abundant, apart from being the most comfortable fabric to use in tropical or temperate climates where it was most worn. Fabrics such as silk and satin saw limited usage among the more affluent and powerful class. Though there are innumerable variations in the turban, they can easily be divided into two broad types – long turbans and square turban pieces. The long piece is seven to ten meters long with the width varying from twenty-five to one hundred centimetres. The square pieces could vary in size between one to three meters per side, with one to one-and-a-half meters constituting the most useful size. There are an amazingly wide variety of turbans across different cultures and religions. Distinctions are made on the basis of size, shape, material, colour, ornamentation, and method of wrapping. In the Muslim world, religious elders often wear a turban wrapped around a cap known in Arabic as a kalansuwa. The shape of these caps can be spherical or conical and this produces variations in the turban shape. In Iran, leaders wear black or white turbans wrapped in the flat, circular style. In the Indian state of Rajasthan the style of turban may vary even within the distance of a few miles. The Rajput turbans are remarkably different from the kind worn in any other region in India. There are specialists called pagribands whose skill is in the art of tying the turban and were employed by the erstwhile royalty for their services. Some famous styles from Rajasthan are the Jaipur pagri and the Gaj Shahi turban, the fabric of which is dyed in five distinctive colours and was developed by Maharaja Gaj Singh II from the Jodhpur royal family. The turban as a headdress is not merely a fashion statement or cultural paraphernalia; it has symbolic meaning beyond the obvious. It serves to identify the wearer as a member of a particular group, tribe, or community, and serves as an introduction to their cultural, religious, political, and social orientations. Sikh men commonly wear a peaked turban that serves partly as a covering for their hair, which is never cut out of respect for God’s creation. The turban has significant associations with the concepts of respect and honour. A man’s turban is supposed to signify his honour and the honour of his people. The exchange of turbans is considered a sign of everlasting friendship, while presenting someone with a turban is considered a great token of esteem. An exchange of turbans also signifies a long relationship and forges relationships between families. Thus, the turban is an intrinsic part of all ceremonies from birth until death. Conversely, it is considered a grave insult to step over or pick up another man’s turban. It is linked intrinsically to the “ego” of a person. To remove a turban and lay it at another’s feet symbolizes submission and an expression of humbleness. The turban at a glance conveys the social and economic status of the wearer, the season, festival, community, and the region. It is also distinctive by the style of wrapping-each fold telling its own story. The tightness of the drape of the headgear, the lengths of the hanging end, the types of bands which are created on the surface, all say something about its wearer. The colours of turbans vary in different cultures and are imbued with complex connotations, emotional context, and rich association. They are used to convey mood, religious values, customs, and ceremonial occasions. In India, ochre is the colour of the saint, saffron denotes chivalry, and prosperity. White turbans, considered by some Muslims to be the holiest colour, are used for mourning and by older men, whereas dark blue is reserved for a condolence visit. Among Sikhs of north India, blue and white cotton turbans are essentially religious in nature. In the Middle East, green turbans, thought to be the colour of paradise, are worn by men who claim descent from the prophet Muhammad. Shape and size of the turban are determined by many conditions. Chief among these are the climate, status, and occupation of a person. Turbans are big and loose without hanging tails in the hot desert and thus serve a protective function. Merchants involved in more sedentary activities would wear ornamental turbans with long hanging tails. The turban was introduced into fashionable European dress in the early fifteenth century and its usage continued until the sixteenth century. It has been revived many times in women’s fashion at intervals since the sixteenth century. The turban has acquired a more contemporary form in the twenty-first century. Though it continues to exist in various parts of the world in its more traditional form, of late various fashion designers and couturiers have adapted the turban to give it a more fashionable and chic look, making it a popular fashion accessory. Even though in its more contemporary form the turban may not retain the same symbolism that is attached to its more traditional form, it nevertheless reinforces the importance of this garment. Indus Valley Civilization: The dress of ancient ‘Mohenjo-Daro’ people. Textiles are rarely preserved and Harappan figurines are usually unclothed, so there is not much evidence of Harappan clothing. Small fragments of cloth preserved in the corrosion products of metal objects show that the Harappans wove a range of grades of cotton cloth. Flax was grown and may have been used for fibres (alternatively it was grown for its oilseed). Native Indian species of silkworm may have been utilised for silk (inferior to Chinese silk), as they were a little later in South Asia. It is not known whether the Harappans raised woolly sheep, but their trade with Mesopotamia probably brought them abundant supplies of woollen textiles. The Harappans also probably continued the earlier tradition of making clothing from leather. Dyeing facilities indicate that cotton cloth was probably dyed a range of colours, although there is only one surviving fragment of coloured cloth, dyed red with madder; it is likely that indigo and turmeric were also used as dyes. The limited depictions of clothing show that men wore a cloth around the waist, resembling a modern dhoti and like it, often passed between the legs and tucked up behind. The so-called “Priest-king” and other stone figures also wore a long robe over the left shoulder, leaving bare the right shoulder and chest. Some male figurines are shown wearing a turban. Woman’s clothing seems to have been a knee-length skirt. Figurines and finds in graves show that Harappans of both sexes wore jewellery: hair fillets, bead necklaces and bangles for men; bangles, earrings, rings, anklets, belts made of strings of beads, pendants, chokers and numerous necklaces for women, as well as elaborate hairstyles and headdresses. Over in the ancient Middle East, Biblical Jews wore turbans as did the Egyptians, across the Mediterranean Greeks too wore them. So the turban is a very old mode of Head dress. Jaswinder Singh Chaggar is a local oral historian. Jaswinder’s interests include religious history, the industrial revolution and the relationship between local and global history. Jaswinder has worked on projects ranging from local Sikhs at Wolverhampton Art Gallery, work for the Wolverhampton Inter-Faith Organisation, and putting people in contact with places of worship, from primary school pupils to university students, and adults. We were lucky enough to have Jaswinder provide a world history of turbans and beards for our project. Tarsem Singh Sandhu gives an extended interview recounting his experiences of living in Wolverhampton, from the 1960’s up to the present. View some of our gallery images here.